This Labour day I've returned to some past databases. One self-imposed task is continuing to add to the data of hourly Ontario electricity generation that begins September 1st, 2010. I've queried the data and created some graphics, many of which simply reinforced old messaging I've written on, repeatedly. However, the messages could use reinforcement and one new graphic view gobsmacked me, demanding a quick post. Years ago it occurred to me to try to reproduce work done at Oxford with Ontario data - which provided the basis for a series of posts on the cost of of industrial wind in my province. 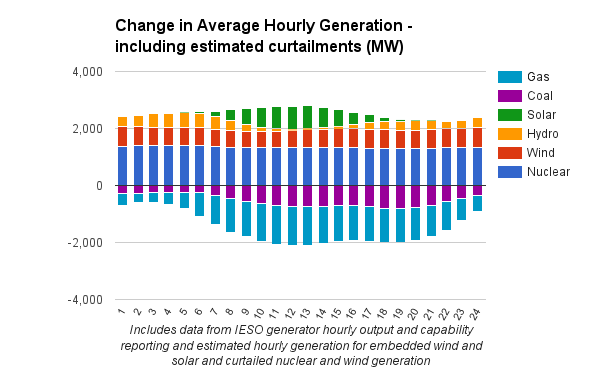 I continued capturing the generation data and added estimates of more obscure statistics, including hourly solar generation and curtailed supply. Today I looked at hourly average figures comparing my first 12-months of data (September 1, 2010 to August 31, 2011) and the corresponding dates for the recently completed 12-months. For those slower to get their angry geek going, Ontario's hydro looks like it's being sacrificed due to extraordinarily expensive solar power. During the 5-year data collection period the Niagara Tunnel and Lower Mattagami projects both completed, at a cost near $4 billion. The solar costs are more speculative because the reporting from the IESO is awful. 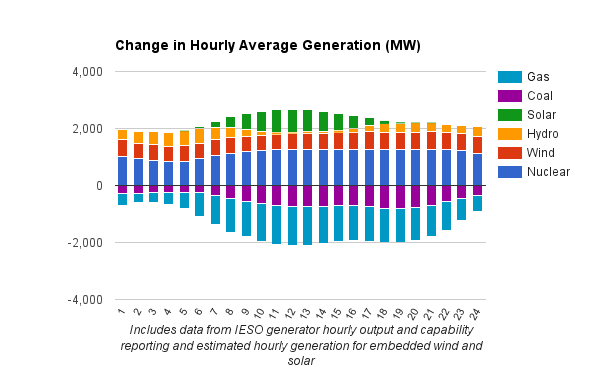 I have not estimated hourly curtailment of hydro, but OPG reports they rose to 1.5 terawatt-hours (TWh = 1 million MWh) during the first half of 2015, nearly double the 0.8 TWh of a year earlier. As OPG reported 3.2 TWh curtailed in all of 2014, the indication is OPG is now spilling nearly 4 TWh of electricity potential annually. There's no denying the fossil fuels are being used less in generating Ontario electricity. The aging non-utility generator contracts are being rolled back, but Ontario remains committed to close to 1000 MW of thermal supply each hour. At the lowest demand hours of night, the minimum commitment is now essentially the average production. Looking at the same data differently, and some different data, it's apparent supply is increasing most in the low demand evening hours, and least in the relatively high demand hours of late afternoon and early evening. Rates are down in almost all hours, but least during what I'd expect are the residential peaks, at the start of the day and around dinner. 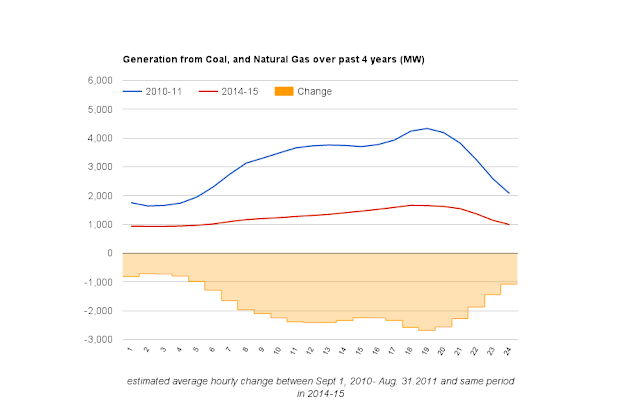 The system operator (IESO) has poor reporting on actual demand too, because embedded generation is omitted. 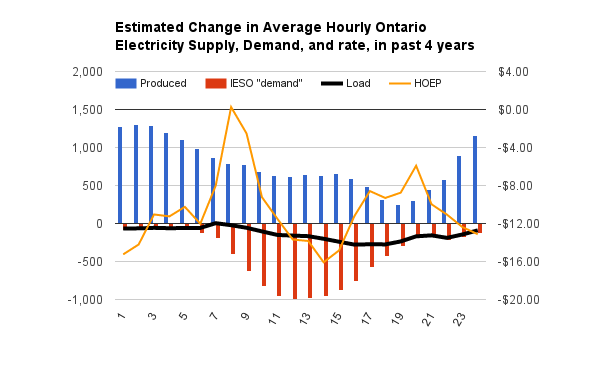 My estimate of actual "load" may not be accurate, but it certainly will be more accurate than the IESO's "Ontario Demand" which mainly serves to demonstrate the growth of embedded solar generation (as reduced demand). 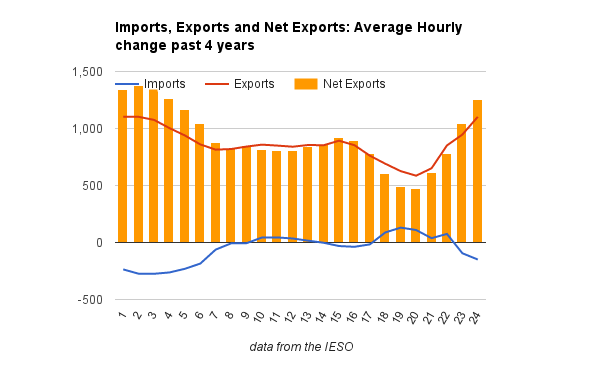 The final chart I've produced for this post shows the growth in average hourly exports over the past 4 years, As expected, the growth is highest overnight, but it's significant at all hours. Despite the drop in market rates, the IESO shows the year-to-date average commodity rate for the first 7 month of 2015 up over 14% from the same period in 2014.